... I started to perform with some like-minded souls, step dancers from the All Set group led by Mary Fox, a wonderful lady, hugely influential in the revival of Set Dancing “up North” in the 90s. How thrilled was I to be asked to perform alongside the lady who was responsible for the class I attended as a beginner (set) dancer some 15 years earlier. We are regularly seen at the yearly Derry dance weekend both teaching and performing; we performed at the Fleadh in Derry; for the opening of the newly renovated Crescent Arts Centre in Belfast; at “BelfastTrad’s” 21st Anniversary Gala Concert in Belfast City Hall. More recently I was asked to perform at the Willie Clancy Festival (the world’s largest traditional festival) in the dance concert. How thrilled was I when Michael Tubridy, the compere for the evening (and one of my heroes) asked me to dance “Maggie Pickens” to his accompaniment. That same summer I stopped off in Sligo en route to and from the “Willie Week” to visit a friend who is involved with the Coleman Centre, a wonderful establishment dedicated to the memory of Michael Coleman, the Fiddle Player, and was asked to dance at their weekend concerts either side of the Willie Clancy Festival. All in all, in was a great summer as I travelled on from Sligo to central France to dance, teach and perform both set and step dancing at Gennetines (with Bal Feirste) and St Gervais (with the Claddagh Dancers), two wonderful festivals primarily dedicated to the folk dancing of Europe. On my return I was asked to teach the beginners' set dancing class (as part of a cross-community programme) for Turas/Skainos in East Belfast and a second beginners' set dancing class (with Berni Corr) at An Droichead in South Belfast. During that term I decided it was time to start my own solo step class in my home town of Lurgan, which commenced on 21 January 2015. But where did it all begin . . .
My parents met in England, like many of the Irish they had travelled across the water in the 50s to find work, and found each other. They married and while their children were still young moved back to Ireland. My father was from Limerick City and my mother from Lurgan, Co Armagh. They settled in her home town in the late 60s with the arrival of the Goodyear factory and renewed opportunities for employment. 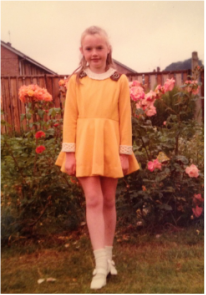 I did some Irish dancing as a child, but it was in my adult life that I became addicted. My father was a gifted musician and singer, and it was said that my mother was a great dancer “in her day”! I was encouraged to play music and started with the tin whistle at a young age, moving on to classical piano soon after. I would class the piano as my main instrument and I continue to play and teach to this day. I took up the bassoon in secondary school (in truth, I was forced into it!). I remember my mother and I going to see the music teacher (Mrs Ethna McLoughlin) to ask if I could take up the flute, she took one look at me (tall for my age) asked to see my hands and said “I have the very thing for you . . . . a bassoon”. (There was no saying no to Mrs McLoughlin!) Given I was only 11 years old I had no idea what a bassoon was, she took me to her store and showed me a picture of something that looked nothing like a flute . . .
Having said that, I did grow to love the bassoon and within the year I was playing in the regional Junior Wind Band, progressing through the years to first bassoon in the Senior Wind Band and local Newry & Mourne Symphony (amateur) Orchestra. I went on to study music at the University of Ulster achieving a 2:1 in my BA, with bassoon as my first study and piano as my second. The bassoon travelled with me when I moved to London where I continued to play in an amateur orchestra. 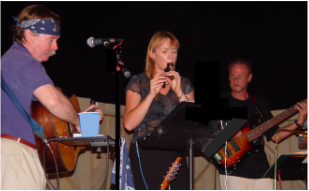 Bizarrely, I was drawn back to traditional music when I moved overseas to work in the Middle East, and played with many fine musicians and performed regularly with a mixed bag of expats. We formed a group, calling ourselves “Get Reel” and performed regularly both in Saudi Arabia and the neighbouring Bahrain. On my return to Ireland I took up the concertina, now there’s a headache! I had loved the sound for years, and took the plunge through Belfast’s Traditional Music & Dance Society (BelfastTrad), I do love the instrument even though it tortures me at times! 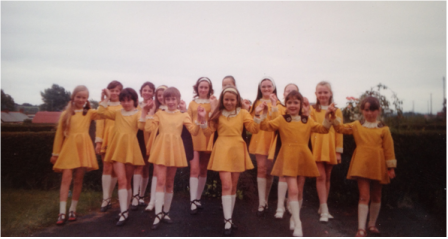 While living in Belfast in the 90s I was coaxed by a flatmate to attend Mary Fox's Set Dancing class; Set Dancing was at the height of its revival in the north and I immediately loved it. As said, I moved overseas in the late 90s and sadly my dance shoes hardly saw the light of day except on holidays to Ireland (extremely well-travelled shoes!). I threw myself into playing; whistle with “Get Reel” and with the lovely tax-free money I bought a shiny new Yamaha piano, I had never imagined that one day I would own such a beautiful instrument, it is still one of my most precious possessions. Getting back to dancing . . . . in 2006 I returned to both Ireland and my love of set dancing. I was intrigued with an advertisement for solo step dancing for adults and decided to give it a try. The only way to describe the effect it had on me is to say “I became obsessed” with the steps, footwork, the differing rhythms, the percussive qualities of the dance. 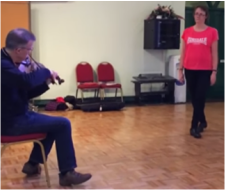 I took a weekly class with “BelfastTrad”, moving up quickly from beginner to advanced level, and started to travel the country looking for different dances, different teachers; from there I started to perform and now to teach. The above was written for the launch of this site in January 2015, sadly on the 18th of August 2015 my darling mummy passed away which has been a huge loss to many, I take great comfort knowing she was around to see my dream come true. May she rest in peace in the arms of my father, I dedicate this site to their memory. Let me be an inspiration to you; I was 40+ when I started to step dance.